Iraq and Syria are in turmoil. In Iraq, Islamic radicals of the Islamic State of Iraq and Syria (ISIS) are threatening to plunge the country back into civil war. In Syria, a ruthless regime is fighting a variety of opposition groups in a civil war that already has left more than 160,000 dead, most of them civilians. As a result, thousands of Christians in both nations have become homeless in their own countries and many have fled to Lebanon, Jordan and Turkey—with few prospects of returning home anytime soon, if at all. 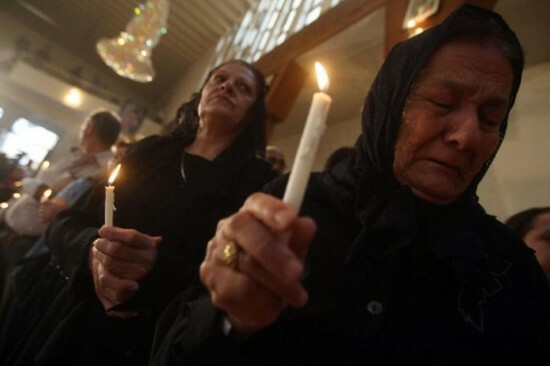 Maronite, Chaldean and Melkite Church leaders are agonizing over the prospect of the disappearance of their flock, their lands are robbed of an ancient heritage. These prelates plead with Western Churches and governments for help, but they make once thing crystal clear: they are firmly opposed to policies that fast track the emigration of displaced Christians to Western countries. That, they know, is a sure recipe for these refugees never to return home and face the inevitable hardship of rebuilding their lives, quite literally, from the rubble of destroyed homes and livelihoods. Yet, the Christian patrimony of the Middle East must be protected at all costs. “We are strong in our faith, rooted in our history. We have been here for 2000 years. We refuse to go!” That is the message proclaimed by Maronite Bishop Elias Sleman, who heads the Eparchy of Latakia, Syria. He is on a mission to get the support of Catholics in the US and Europe to help provide his people with the means to return home, make a new start, or simply stay put. Christians are peacemakers.“Help us stay,“ Bishop Sleman cries out.